BabySitterReviews.net – We Rate the BEST Sitter Services! Online babysitter services are now becoming a growing trend. While it may not suit everyone, they have become a babysitter solution for a growing number of people. The process of online babysitter services varies with different companies, but typically parents join these online services for a fee but sitters enroll for free. The rules and age restrictions are different for different groups. Also these online babysitter service companies claim that they screen and conduct background checks on potential sitters; information about these sitters is typically included in the website, and often includes several ways a parent can check with references or talk with the sitter before any agreement is reached. Babysitter service companies also feature testimonials of parents and/or sitters, and often include photos to help parents and provide an additional comfort level to their services. This is one of the top choices for babysitting services. It was launched in 2001 and now serves more than half a million users all across the country. Users can enter their zip code into their “Try it Now” feature and will be surprised to see the number of choices available in their area for babysitting. Their caregivers are “ranked” electronically and every time a search is performed, the caregivers with multiple certifications, background checks, and great feedback will usually appear first. Sitters often include video interviews in their profile, which can really speed up the screening process. When a job is posted, users get to tell the sitters exactly what they are looking for and when. With all of these details presented upfront, users then choose from the best matches in terms of skill sets and availability. Sittercity offers a Video Monitoring Program after a caregiver is hired, which is the simplest way to observe the activities at home when they are not there. A wireless video camera will record the video on a DVR as well as send live to any computer or a smart phone. This makes one comfortable knowing that their family members and their belongings are safe in their absence. Sitters must be at least 17 years of age. Sittercity helps its users through a four-step screening process, during the hiring process, which includes showing how to conduct an interview, checking references, reviewing feedback and running background checks. Sittercity also offers free access to background checks, and has partnered with one of the country’s leaders in background checks, LexisNexis, to provide its users with a simple tool that is easy to use and can get a response in just seconds. Users can use their services free of cost for a week and then choose either a monthly or yearly membership plan. Coupons: A Sittercity Promo Code can get you 25% off your membership fee! Care.com was launched in 2007 and users can sign up for full access to their community of trustworthy, high-quality caregivers and service providers. The tool, “My Town” provides information about the care providers available in any US city or town before they become a member. Also one can post a job listing detailing their specific needs, or use their refined search results to find care providers who match their criteria. Users can request a free background check, listen to references, view photos and ratings, and much more. Members of Care.com can view contact details for caregivers or send them direct messages. One of the best features that differentiate Care.com from other online babysitter services is the “care on call” feature. This “care on call” feature works as an “urgent substitute” in case one of the care givers is not available on the day needed. Users can call Care.com and they will notify their care givers in that particular area in order to help fulfill the urgent need. When a user requests a background check through Care.com, the following information is usually verified: address, social security number and criminal record. Once a user has subscribed to Care.com as a care seeker, they can request the first background check on a sitter at no additional cost. Coupons: A Care.com Promotion Code can save you 25% off your membership fee! Nannies4hire.com is another online babysitter and nanny web service available to parents. It also helps sitters register with its website. 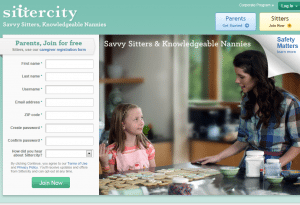 Nannies4hire.com allows users to enter their zip code to find sitters. This helps the parents and families see the sitters in their area and allows them pay for the service later on. Unlike other online sitting services companies, Nannies4hire.com lets the parents to see over 500,000 profiles of sitters before deciding to register and pay. Users will place their zip code in the box that appears on the very first page of the site and hit the search button. All the sitters and nannies around that area will be shown and thus makes the deciding factor much easier on whether to use the service or not. No pre-screening is done on babysitters, but they highly recommend background checks. They also have an online investigation service which is located on the site. $129 for 30 days job postings and resume access. Coupons: A Nannies4Hire Coupon can save you 20% off your membership fee! These above mentioned online babysitter reviews will help parents to select the best sitter services required based on their preferences. Making online decisions about babysitting services is gaining more strength and is a best solution that more and more families are now opting to use.